Over the past few years, improvements in mass-spectrometry methods have resulted in a big increase in throughput for the identification of post-translational modifications (PTMs). It is even hard to keep up with all the phosphoproteomics papers and the accumulation of phosphorylation data. Most often, improvements in methods result in interesting challenges and opportunities. In this case, how can we make use of this explosion in PTM data ? I will try to explore a fairly straightforward idea, on how to use phosphorylation data to predict kinase substrate specificity. I'll describe here the general idea and just the first stab at it to show that I think it can work. 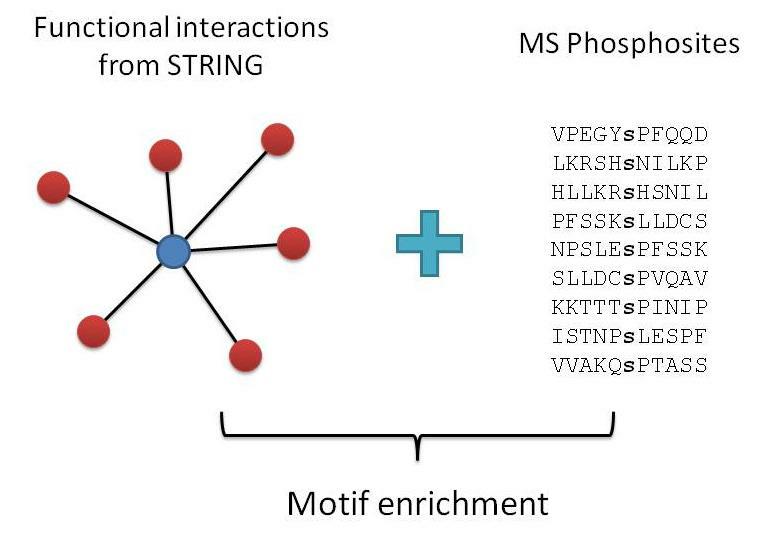 The inspiration for this is the work by Neduva and colleagues that have show that we can search for enriched motifs within proteins that interact with the domain of interest. For example, we can take a protein containing and SH3 domain, find all of it's interaction partners and you will likely see that they are enriched for proline rich motifs of the type PXXP (x = any amino-acid) that is the known binding preference for this domain. So the very obvious application to kinases would be to take the interaction partners of a kinase and find enriched peptide motifs. 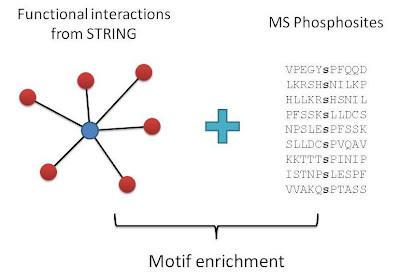 The advantage of looking at kinases, over any other type of peptide binding domains, is that we can focus specifically on phosphosites. This was probably the easiest kinase to try since it is known that it typically phosphorylates its targets at multiple sites and it heavily studied. Still, I think there is a lot of room for exploration here. If anyone is interested in collaborating on this let me know. If your doing computational work I would be interested in some code/tools for motif enrichment. If your doing experimental work let me know about your favorite kinases/species.